While the Civil War raged and the war with Holland was fought, the gaps in the map of the area around Television House were being filled in. 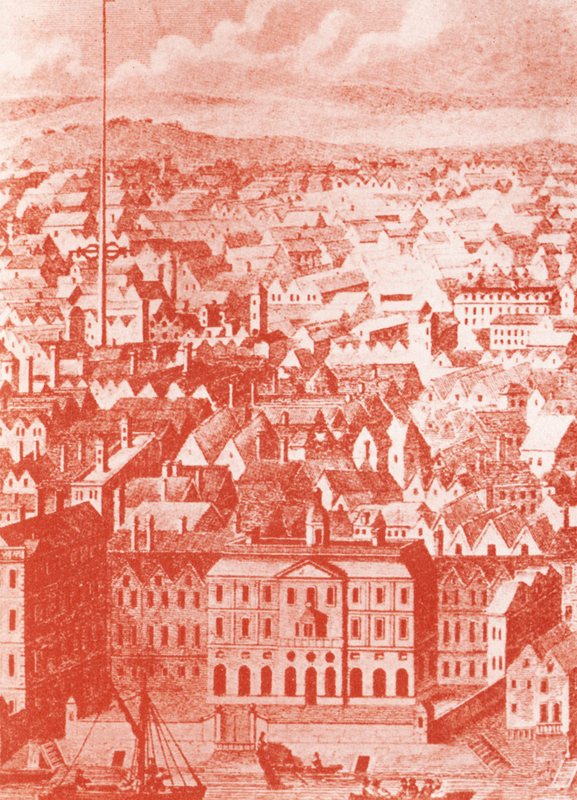 ‘The newest and exactest Mapp of the most famous Citties London and Westminster, with their suburbs, and the manner of their streets’, published in 1654 shows houses sprouting out from St Clement’s Church towards the Strand. The gardens of a circle of houses appear to occupy the land on which Television House and its surrounding buildings now stand. Lincoln’s Inn Fields are still enclosed but Butcher’s Row and Clare Street have appeared in the area. Butcher’s Row came into existence during the reign of Queen Elizabeth on the site of a meat market between the bottom of what is now Kingsway and St Clement Danes Church. 1654 map of London and the region around Television House which is now placed somewhere around the centre of the area shown. The houses were mostly built of wood and plaster with overhanging storeys. Here in the stench-laden streets the plague ‘frowned destruction on the miserable inhabitants’ each summer. Here, too, in one of the multitude of houses was later hatched the Gunpowder Plot by Messrs Catesby, Percy Wright, Winter and Guy Vaux. Near to the present site of Television House once also stood Clare Market, built and opened by John, Earl of Clare, in 1656 in what was a spacious field to the west of Lincoln’s Inn Fields. The streets which grew up around the market all bore the family names of Clare, Denzil, Holies and Vere. The Earl of Clare himself built a large and stately mansion, which he shut in with a high wall no doubt due to the fact that Charles I had, in 1640, granted a licence to Thomas York to erect as many buildings as he thought fit upon St Clement’s Inn Field ‘to be of stone or brick’. The market was held there three times weekly and the Earl enjoyed ‘all the emoluments thereunto appertaining’. It quickly became noted as one of the best markets in London for all kinds of provisions, both flesh and fish. At one time there were 26 butchers there who slaughtered from 350 to 400 sheep weekly and 50 to 60 bullocks. Near the market was a tripe house and in a separate yard the Jews slaughtered their cattle according to their religion. The galleries were empty, however, in 1664 when the Great Plague of London swept through the population in the autumn of 1664. It started not far from the present site of Television House in the upper end of Drury Lane. A cargo vessel had carried it from Holland, where 20,000 people had died in Amsterdam. Rapidly it spread through London. A frost for three months from December, 1664, stopped it for a while, then as the warmer weather arrived it broke out in full force. In August and September 1665, 50,000 died, 12,000 in one week. During the whole year the plague claimed 100,000 victims. Grass grew in the main streets, churchyards were choked and large pits had to be dug. Carts rumbled through the streets to the cry ‘Bring out your dead’. One survivor was Nell Gwynn, who was living in the fashionable part of Drury Lane in 1667. This is what the buildings around The Strand looked like in 1700. Note the Maypole (centre left) and the green hills beyond. Violence was always around the corner. On July 21, 1683, Lincoln’s Inn Fields saw the execution of Lord William Russell, it being the nearest open space to Newgate. Crowds flocked to the fields for the occasion. 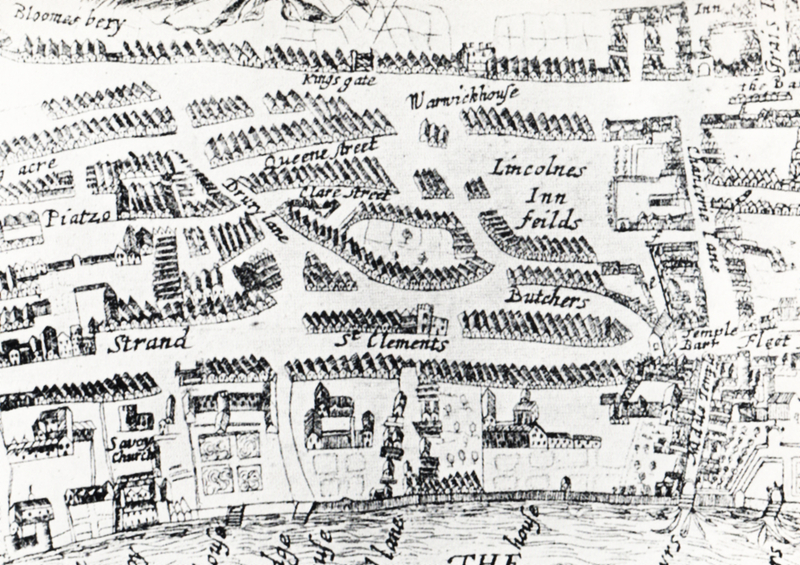 Lincoln’s Inn Fields is now enclosed, probably with wooden palings; the Strand has a maypole at its eastern end; Wych Street and Clements Street occupy ground now covered by the Aldwych and the bottom of Kings-way; the King’s Theatre stands on a site nearly in the same place as the present Drury Lane Theatre. No wonder the area was levelled, laid out and iron railing erected around it in 1735… more than 100 years after a Commission from the King had laid down that Inigo Jones should be responsible for laying the area out, thus disproving the fable that Inigo Jones planned the size of Lincoln’s Inn Fields to equal the base of the Great Pyramid. 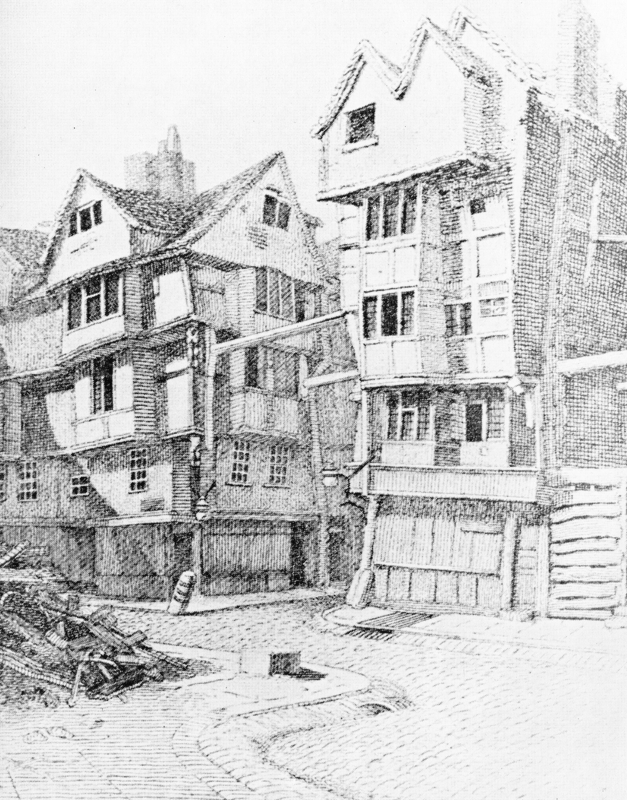 These houses in Butcher Row in 1798 look as if they might fall down at any moment. In fact one seems to have done just that at bottom left. Not far away from the fields public houses and eating houses abounded in the Clare Market area during the eighteenth century. It was in one of the eating houses near Television House that Boswell probably found Johnson. 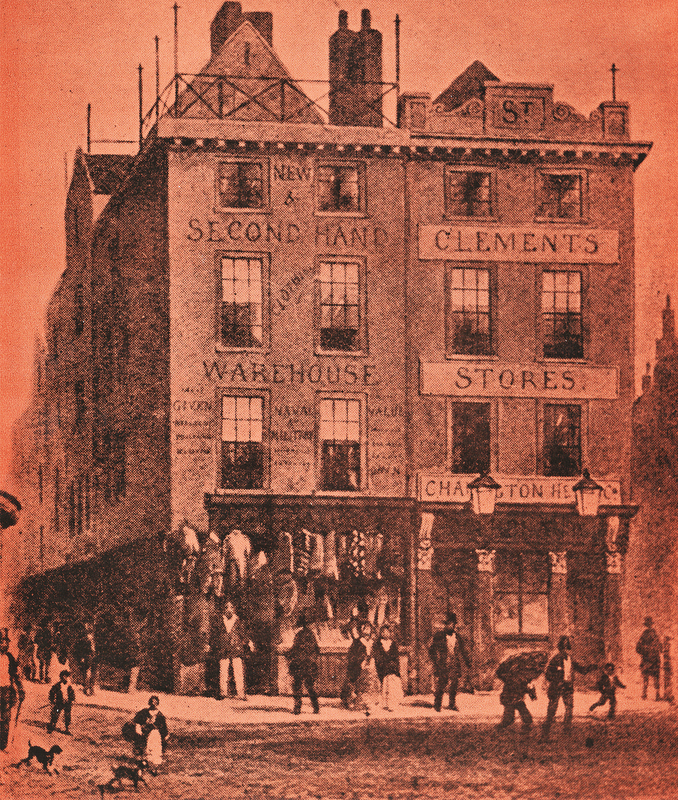 The historian Oldys reports having seen Johnson at Clifton’s eating house in Butcher’s Row. He records that Johnson and an Irish gentleman started arguing about why part of mankind was black. Apparently the argument became somewhat heated, ending with Johnson stalking away. Afterwards the Irishman was heard to say: ‘He has a most ungainly figure, and an affectation of pomposity unworthy of a man of genius’. Here, too, the young bucks entertained their lady friends at ‘the famed chanting saloon’. This was the beginning of the music hall in this country, for it was from these taverns (within a stone’s throw of Television House) that the halls developed. By the 1820s another public house in the area-the Black Horse in Old Boswell Court – had taken over the mantle of the Hope Tavern. There was even a raised stage. It was one of the most popular entertainment places of its kind in London. Life was by no means slow at the ‘Black Horse’. The celebrated Miss James used to perform in her favourite character of the Dashing White Sergeant. Holywell Street and Wych Street in 1855. Note the fact that the store on the left claims to be a naval and military outfitters. Down in the basement of the pub was another room in which thieves, pickpockets and cracksmen used to meet. They had a kind of club towards which each used to contribute so that funds should be available to pay for legal assistance if any member needed it. They lived life to the full in those days. Perhaps it was because the threat of a sudden death was never far away. Today we live under the cloud of atomic extermination. A century or so ago disease was the fear. Epidemics mushroomed through the dirty, overcrowded streets. One such epidemic in 1849 resulted in strong complaints against the use of St Clement Danes as a burial ground. A vault, known as the Rector’s vault, was the cause of many of these complaints. Steps led down into it from the aisle of the church and when opened the gases from the decomposition of the bodies was so strong that lighted candles were put out. Nobody could go down into it until two to three days after the door had been lifted. This overcrowding applied to most of the churches of London in the forties of the last century. Action was taken in 1853 when St Clement Danes and other churchyards were closed as burial grounds under a Nuisance Removal Act. One source of pollution had been removed. Others remained. Not far away, Newcastle Court (off Newcastle Street leading up to the present Aldwych) was labelled ‘a den of iniquity’. Ronald Elliott was editor of 'Fusion', the Associated-Rediffusion house magazine, and wrote and edited for A-R's subsidiary TV Publications Limited.